Oh look, a Season Pass. And none of us were shocked. Just download a VPN software like Avira VPN (trustworthy)… install, select Australia, Japan, Hong Kong (wherever ping is good)… and start Uplay. That’s about it. After quitting Anno/Uplay…wait a sec. before disconnecting the VPN… because Uplay syncs your data. You need to have the VPN on all the time (when you are playing). But Avira e.g. comes with 500 mb free traffic - that you’ll never need until Anno is released in the US. Sunken Treasures and The Passage sound absolutely superb. Hope the execution matches the summary. Also, yes please to the Anarchist! How much will that slow down the game’s speed do you think? Not at all. It’s no shooter. I couldn’t tell the difference. Not sure why the game didn’t pre-load for me, but am installing now since I currently reside in “Australia” LOL. Using NordVPN since it seems cheapest I need a permanent VPN when in hospital for streaming and access to most of Youtube (cut out by hospital firewall). Watch out for the spiders and crocodiles. I think it goes live at midnight eastern tonight? I don’t ever bother getting Ubi games anywhere other than Uplay these days. (usually with a code from GMG like I did for this). Played just a little bit of the intro so far, but I like the look of the new Anno. 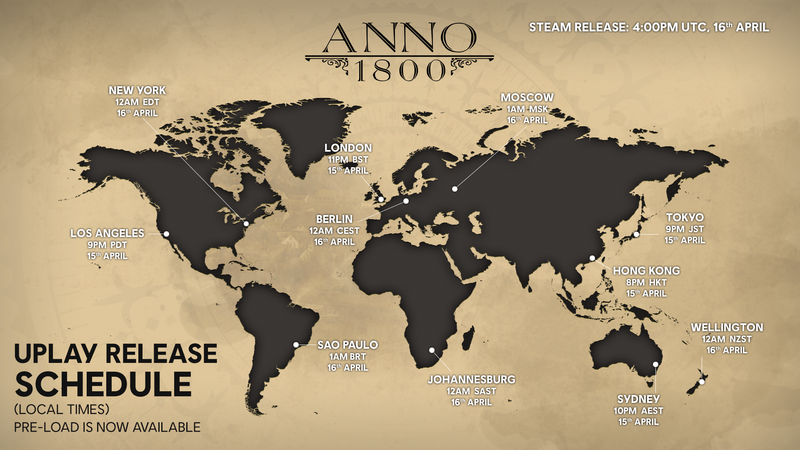 Release times for the impatient! I also found that my uplay key is now available on Humble, if anyone else has been waiting for it for preloading. Gah, think I am gonna cancel my Steam order and just get it on Humble, I want to play NOW. I feel like the most patient person in the room. Playing now - thank you - lovely Australian continent being a convenient day ahead! Soooo, do I need to make a road going up to a sheep farm? I am so patient, I’m waiting until tomorrow. Is the bonus technically even available yet? The chess table park thingy is in Anno 1800’s ‘Club Rewards’. I believe you have to clicky it. Go here, spend points to get emblems, statues, and portraits for the game, if you like, and/or redeem the fact you played in the open beta for stuff.